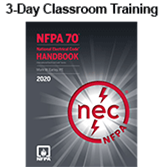 Beginning November 18, this class will be taught using the 2020 Edition, NFPA 70, National Electrical Code (NEC). Improve your ability to use and apply today's NEC® requirements in your work environment with applied learning taught by the nation's leading electrical code experts. Review concepts and earn your Certificate of Educational Achievement* online! Fully updated for consistency with the 2017 edition of NFPA 70®, National Electrical Code®, the dynamic NEC Essentials Classroom Training features three days of high-impact instruction that helps you ensure safe and compliant electrical installation and design in your work setting. Advance your ability to locate, interpret, and apply requirements in the ever-evolving NEC. Interact with NFPA's renowned electrical instructors in a collaborative learning environment, with topic-driven lessons tailored to real-world situations. Then, solidify your Code knowledge through engaging discussion, revised activities, and practical exercises based on key concepts in the 2017 edition of the NEC. You'll leave with vital takeaways that will help you comply, increase confidence in your ability to recognize potential problems, and avoid costly rework or safety violations. The NEC Essentials Classroom Training offers a Certificate of Educational Achievement* available through an online exam taken after the course. Earn the Certificate to demonstrate proficiency in your understanding of seminar topics. *Go online to earn your Certificate of Educational Achievement*! After attending the classroom training, take the online exam at your convenience using the web link provided. You can prepare for the test in your own time frame, using online tools for review. Passing the exam will earn your Certificate of Educational Achievement, confirming your course knowledge. Earn 2.1 CEUs or 21 hours for this 3-day classroom training. Attendance is required to earn CEUs. Please verify applicability with your professional board or organization before attending. Please contact the agency directly to submit verification of course completion.